Who needs a mountain of debt? Each year, the nation's top business schools are flooded with applications from people eager to pursue their MBA dreams. But those aspirations come at a steep price. According to U.S. News and World Report, the average debt load for graduates of NYU's Stern School of Business, MIT's Sloan School of Management, and other top business schools exceeds $100,000. Like most, author Laurie Pickard couldn't shoulder that. But she faced a dilemma: despite two degrees and a Peace Corps stint, she needed a business education to land her dream job in international development. She decided to take her education into her own hands, and found that some of those same prestigious business schools offer MOOCs (massive online open courses) for low or even no cost. By picking the right classes from the best schools, she gained the skills-without all the debt. 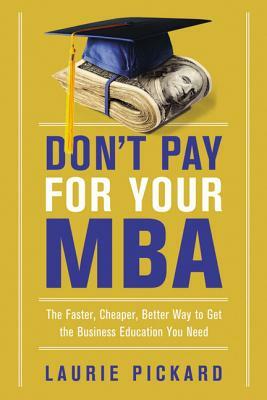 In Don't Pay for Your MBA, Pickard shows self-starters, career changers, and budding entrepreneurs how to navigate the expanding universe of online education. Building on her popular No-Pay MBA blog, Pickard reveals how to: Define your goals and tailor a curriculum that works for you * Master the language of business * Build a strong network * Choose a concentration and deepen your expertise * Showcase your nontraditional education in a way that attracts offers Self-directed learning fills gaps in your training, positions you for promotions, and opens up new opportunities. Why pay exorbitant tuition when you can MOOC your way to success? LAURIE PICKARD founded the No-Pay MBA web site, which has been featured in Fortune, Entrepreneur, The Wall Street Journal, CNN Money, Financial Times, and Bloomberg Business. She also works as a business and entrepreneurship development consultant, most recently at the U.S. Agency for International Development in Rwanda.